I don’t have a lot of experience of two-weapon fighting, in fact I have just enough experience that fighting with a weapon in your off-hand is actually a distraction rather than useful. George Silver wrote in Paradoxes of Defence about a hierarchy of weapons. George Silver was also biased, and in almost every case the English Short Sword (“short” by comparison with the Long Sword, not actually that short) would be better than its continental counterpoint, the Rapier. And so on, into polearms. This makes a lot of assumptions — for example the assumption that the pike, short staff or similar polearm is universally better than a sword single is true in an open fight where there’s enough room to use them. The other assumption is that the rapier will always be worse than the English single handed cut-and-thrust sword for reasons of length, balance, cutting ability and so forth. I happen to think this is true (with exercises to demonstrate it) but (a) it’s arrogant and daft to think that just because the weapon is “better” the fencer is too and (b) Joseph Swetnam takes a contrary view, and while I think his technical argument can be challenged no doubt he had experience of dispatching the English sword with his rapier. Setting aside the rapier, Silver states that the buckler is superior to target, which is superior to dagger as an off-hand weapon. Note that he does not state that a sword and dagger is superior to a sword single. Is it implied? Maybe. Daggers are foremost good for getting in close and stabbing people. This means that if you engage in a lot of close fighting — that is transitioning from the “first distance” at sword length to something much closer — it’s probably better to have a much shorter weapon in your off-hand than not. I say probably, because if your hand’s occupied there’s some stuff you can’t do when inside the point of your opponent’s sword — you can’t grip, immobilize or throw as effectively. But if you’re that close with a dagger you can stab. Now is the hand in his owne course more swifter than the foot or eye, therefore within distance the eye is deceived, & judgement is lost; and that is another cause that the warder with the dagger, although he has perfect eyes, is still within distance deceived. By “no wards” we mean that there is no way you can carry your dagger that will reliably shut down an avenue of an opponent’s attack — which is the whole point of a ward or guard. Once in very close distance, the time of the hand is the fastest of all and the dagger can strike in “many diverse places”. A dagger is also not good in the first distance, simply because it’s not big enough to be a ward in itself. In all such cases the opponent’s blow would be parried by the sword; after that, the dagger might be employed to trap or put aside the blade, but taking the full force of the blow with a dagger alone will be tough. I.33 predates the Longsword as a common weapon; in place there is the arming sword and a buckler held very close to the hand at all times, such that the buckler is an extension of the sword that protects hand and forearm. As I understand I.33 play, one of the objectives is to force your opponent’s hands apart (by cunning binds, etc.) thus weakening their defence. I’m not sure how close this is to Silver’s use of the buckler. Achille Marozzo’s side-sword and buckler illustrations, from the 1536 Opera Nova place the hand with buckler well apart from the sword-hand; the sword and buckler depicted in Paulus Hector Mair is much more I.33 like (see here, translated by Keith P. Myers on the Luegisland Scholars site). These are centuries after I.33 and maybe 60 years before Silver (and of course Italian and German respectively). The only other useful comment is that you can either regard Silver as a very early Renaissance martial scholar, or a very late Medieval one (and opinions tend to go to the latter). Silver’s argument of the Buckler being better than the Targe is pretty simple — the buckler lets you use the “four fights” (again see here)) but the targe, being much bigger restricts the number of positions you can hold your arm, so fighting guardant or close is difficult. This illustrates the most important point — Silver’s context is (a) human scale fighting and (b) specifically the warfare around 1600. While Silver’s roots are medieval and the principles behind his treatise are timeless, the context of which weapon is better is at least biased by both fashion and technology of the time. Which is the best shield? 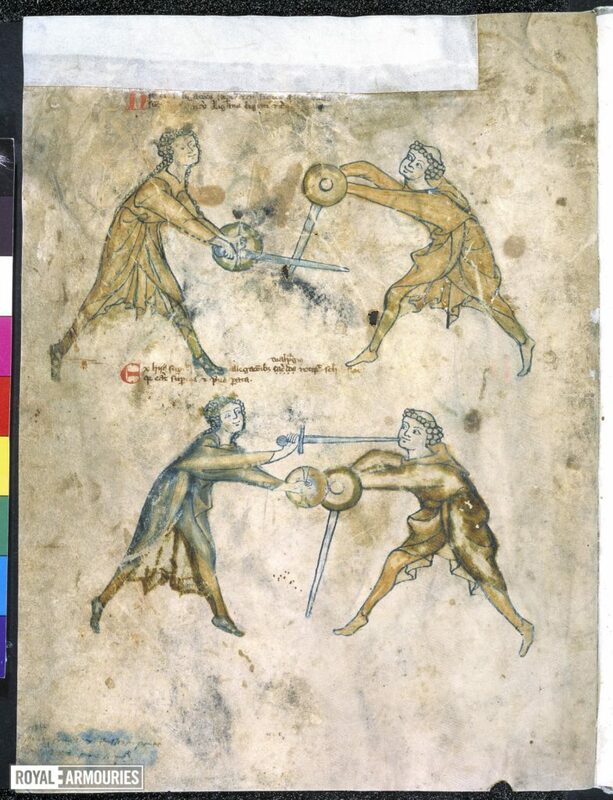 So, for human vs. human fights a buckler is very useful, if you’re using a sword. But since human cultures have used shields of all sizes this can’t be the whole story. Intuitively the bigger the shield the better — except the bigger the shield the harder it is to strike around it, and the more it slows you down. Big shields are really good for defending the person next to you in a formation. They still get in the way of cutting weapons by limiting how you can swing your sword, but if you’ve got a spear — or a friend with a spear — jolly good. Once you get split up and it’s more of a skirmish, it’s touch and go as to which is the better arrangement. Say you have one person with a buckler and arming sword, and another with a scutum and a gladius (a historical mismatch, but possible if you’re playing RuneQuest, right?). My guess is all things being equal the big shield becomes an obstacle for both sides — although the person with the scutum may be slower, they only need to move a little bit to keep the shield between them and their opponent, who has to move a lot to try to get around the shield. Then it’s down to tactics and other factors (like fatigue). If I were the one with the big shield and I were strong enough I’d try to bash them with it in a charge, then sit on them and stab under the shield with my short sword. If I had the buckler I’d try to kick the shield so my opponent fell down, then cut at wrists and ankles while they were down. I quite like this blog post for talking about a range of shields (as an alternative to full plate). I would expand by adding some conditional modifiers, e.g. when fighting in formation, someone next to you benefits slightly from your shield. Do I get an extra attack? The main benefit of carrying an off-hand weapon in, say, D&D is an extra attack (at penalty). This is fine with me, because there’s no real discussion of changing distance — everything is subsumed into the attack vs. AC roll. Swordfights happen at particular distances; and the “first distance” is close enough to strike with the first 3rd of a sword blade, but anything shorter cannot be employed thus. So you don’t get an extra attack. Where a dagger is useful is in enclosing. You could, for example, adopt a Guardant ward, cross your opponent’s weapon and step within distance. At this point you can stab them with your dagger, and they are at a big disadvantage to ward against it (q.v.). But, because you’re now too close to employ your sword, you also don’t get an extra attack. If you’re using two swords of equal length against a sword single, you might think you can strike twice as often. But biomechanically speaking, when you throw your right shoulder towards your opponent to strike with your right hand, you draw your left away. So you don’t get an extra attack, because the weapon is too far away. Then, when you try to follow up with your left, it’s a motion in at least the time of the hand and body, and probably hand, body and foot (see here). So it’s not two simultaneous attacks, it’s one attack followed by a second, and the time between is enough for the opponent to respond defensively. So in summary, you do not get an extra attack in any real-world sense. But that’s by the by. The way D&D and RuneQuest do it is just fine for a game. In general, people stand too close. If you stand too close with your single sword, someone can easily envelop your sword with one of their swords, and hit you with the other one. People get to stand too close because they’re not afraid of being hit in certain places (like the head), so those two-weapon techniques work. LARP weapons are light, springly and the latex makes them sticky. It’s easier to envelop an opponent’s sword, it’s faster to attack with two swords, etc. Because of this distortion of distance, latex bucklers don’t work so well, latex daggers in the off-hand are no good and the bigger your shield, the better. If I were LARPing again I would totally choose a pair of swords and get stuck in.